The lab notebook chronicles our journey in the creation of the Genomikon kit. Many paths were woven together in space and time to reach this finished masterpiece. To help you navigate through these trials with us we have laid out our notebook in a layered fashion. This page gives a sketch of each project and how it interacts with each other. Then follow the links to a projects page for time line of the major landmarks and accomplishments. If you require more details on the project the links within that page will take you to our day-by-day work log. The Building Parts project was responsible to first build a plasmid (plasmid 01)that contained our own specialized prefix and suffix nested inside of the standard BioBrick prefix and suffix. After plasmid 01 existed we inserted the CcdB gene (the "death" gene) between our prefix and suffix removing the gene for Kanamycin resistance (plasmid 02). Plasmid 02 is fantastic base plasmid from which we are able to amplify any part at all because it provides a positive selection marker when transformed into DH5α. At this point we were able to make parts en masse to put in our kit. After obtaining a particular part in a plasmid we PCRed the part and digested it ready to use in Assembly or to Test the plasmid. Before we were able to test parts we created 2 base testing plasmids (vector 01 and vector 02). Vector 01 is designed to test Open Reading Frame parts, or parts that code for proteins. The part is flanked by a promoter and the start codon on one side and a stop codon and terminator on the other. Vector 02 is designed to test linker parts, or parts that control the expression of the Open Reading Frame parts they are next two. In Vector 02 the part is flanked by two distinct reporter genes, that by comparing the relative expression of the 2 reporter genes we can determine the behavior of the linking part. KanA/B' and KanB/A' fragements PCRed on 11-05-2010, digested with BsaI-HF at 37oC for 1.5hours, heat inactivated at 65oC for 30 minutes. Tried to ligate KanA/B' fragments to each other and tried to ligate KanB/A' fragments to each other. Also tried to ligate KanA/B' fragments with KanB/A'. Ligated with T4 DNA ligase for 3 hours at 21oC. Set up liquid cultures of KanRA/B'-Bsa and KanR B/A'-Bsa in pSB1C3 from plates streaked with on 30-05-2010. Miniprepped liquid cultures from 01-06-2010. Ran a 1% agarose gel of the ligations performed 01-06-2010. Digested at 50oC for 1hour, heat inactivated the enzyme at 65oC for 20 minutes PCR purified the digests. Tried to ligate the KanA/B' fragments to itself. Tried to ligate the KanB/A' fragments to itself. Tried to ligate the KanA/B' fragments to the KanB/A' fragments. Took aliquots of ligations at varying times and ran 1% agarose gels to test ligation. Digested some of Minipreps of the KanA/B' fragment inserted into pSB1C3 from 02-06-2010. Made a 1/100 dilution of AmpR and TetR PCR Products from 27-05-2010 and performed PCR reactions to produce antibiotic inserts to make parts. To test the function of E.coli smell variant experiments for our kit, BBa_J45120 (Wintergreen) and BBa_J45200 (Banana) from the MIT 2006 BioBrick Registry were transformed in DH5α cells. Restriction Digested AmpR and TetR inserts from 03-06-2010 to be ligated with psB1C3 vector later on. Both digestions were incubated at 50oC for 1hour, heat inactivated the enzyme at 70oC for 20 minutes. Double Digested Kan/Chlor minipreps to determine orientation. Incubated at 37oC for 1hour, heat inactivated the enzyme at 80oC for 20 minutes. Restriction Digested A/B' psB1C3 vector. Ligated digested A/B' psB1C3 with AmpR from 09-06-2010. Incubated at room temperature for 45 minutes. Transformed with DH5α cells using 15μL of the ligated A/B' psB1C3 with AmpR. We got colonies of psB1C3 with AmpR from the DH5α transformations from 10-06-2010. We made overnights. We experimented with L'Oreal skin toner LB media to see if BBa_J45120 plasmids from 08-06-2010 would produce a wintergreen odor. We incubated cultures in L'Oreal LB in a 5%, 10% and 15% concentration. Miniprep of psB1C3 with AmpR was made from the overnights from 11-06-2010. L'Oreal LB cultures from 11-06-2010 had little growth success. Two of the 5% L'Oreal LB cultures grew. psB1C3 with AmpR miniprep from 12-06-2010 ran undigested on a 1% agarose gel. We digested psB1C3 with AmpR to see if the AmpR insert would be released from the psB1C3 vector. Incubated at 50oC for 1hour, heat inactivated the enzyme at 65oC for 30 minutes. Also, we made more overnights of psB1C3 with AmpR. 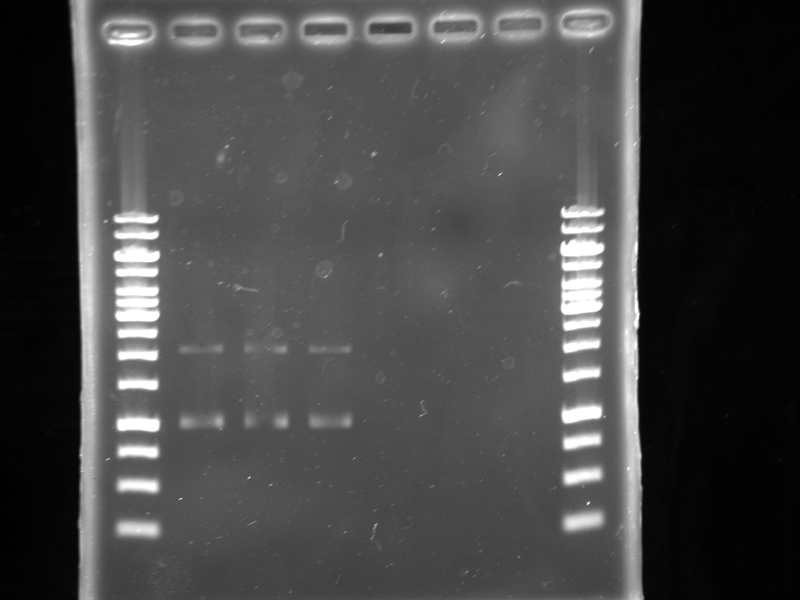 Digested psB1C3 with AmpR from 16-06-2010 was ran on a 1% agarose gel. Transformed 2009 Cambridge color series parts: Bba_K274100, BBa_K274200, BBa_K274002, BBa_K274003, BBa_K274004, BBa_J23100. Also transformed 2004 UTAustin BBa_M30109. Transformed using 5uL of DNA. Performed an enzyme efficiency experiment to determine which of BbsI, BfuAI, BsaI, or BsaI-HF works most efficiently. Made a glycerol stock of PL5 from 1.5mL liquid overnight made 28-06-2010. From the chloramphenicol and chloramphenicol/Kanamycin plates streaked with ccdB BbsA/B', ccdB BbsB/A',ccdB BsaA/B' and ccdB BsaB/A' on [[#28-06-2010|28-06-2010]], only ccdB BsaB/A' #6,8,10,11,12,14,15,18, ccdB BbsA/B' #8,15 and 20 grew on only the chloramphenicol plate. Made 5mL overnight liquid cultures with chloramphenicol of the some of the streaks that worked (ccdB BsaB/A' #6,8,10,11,12, ccdB BbsA/B' # 15, 20 and ccdB BsaB/A'#5 which didn't work but is a positive control). Miniprepped liquid culture grown 28-06-2010 of Kan BsaA/B' #7. Concentration is 293.4ng/μL. All the transormations of Cambridge 1009 color series performed 28-06-2010 worked. Made 5mL liquid cultures of each part. Made competent Dbl3 cells by the Inuoe method from liquid cultures grown overnight. (set up on 28-06-2010). The OD of the culture was 0.775. We Ran enzyme efficiency experiment with the same specifications as on 28-06-2010 but omitting BsaI-HF from the experiment because BsaI, BbsI and BfuAI appear to be the best of the enzymes. Also we ran the experiment with 10 Units of each enzyme not 20 Units. Ya! We got colonies of the ccdB BfuA/B' an ccdB BfuB/A' part plasmids that were plated 29-06-2010. Miniprep of liquid cultures made 29-06-2010 of transformations of Cambridge 2009 color series. Concentrations are as follows: J23100, 397.7 ng/μL; K274100, 388.9ng/μL; K274200, 556.5ng/μL; K274004, 106.1ng/μL; K130109, 82.5ng/μL; K274003, 161.0ng/μL. Strategy: to insert Kan into pSB1A3 after cutting both with NotI. Then, digest with BsaI to take Kan out and insert chlor and tet parts. Incubated at 37C for 1 1/2 hours. Incubated at room temperature for 1 hour. Lanes 2-4 are digests of pSB1A3 and kan AB fragment with NotI. Lanes 5-7 are ligations of the digested pSB1A3 and kan fragments. Note that no ligated DNA shows up on the gel due to a small volume of digestion (3ul) loaded. Lanes 2-4 are digests of pSB1A3 and kan AB fragment with NotI. Lanes 5-7 are ligations of the digested pSB1A3 and kan fragments. Note that no ligated DNA shows up on the gel due to a small volume of digestion (3ul) loaded.